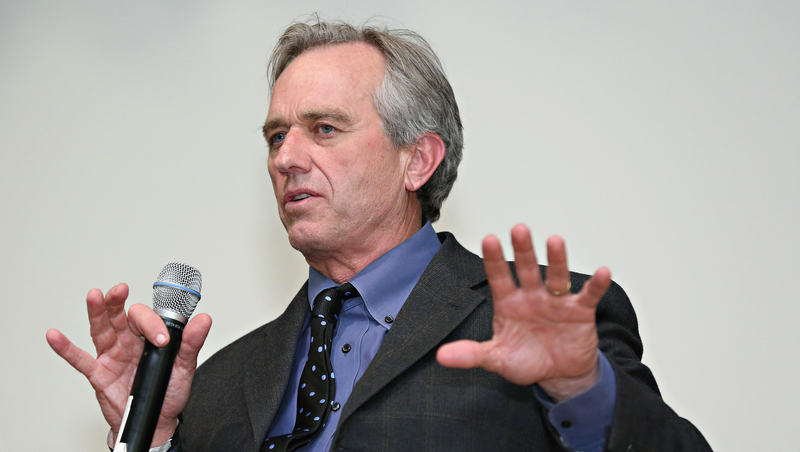 SACRAMENTO, Calif. -- Robert Kennedy Jr. apologized Monday for describing the number of children injured by vaccines as "a holocaust" during a film screening last week. The nephew of President John F. Kennedy and son of former U.S. Attorney General Robert Kennedy used the term last week at a screening in Sacramento of the film "Trace Amounts." The movie links autism to a vaccine preservative, even though the medical community says such claims have been scientifically disproved. Kennedy said he was struggling for a way to convey the effects of autism on children and their families. "I want to apologize to all whom I offended by my use of the word holocaust to describe the autism epidemic," Kennedy said in a statement. "I employed the term during an impromptu speech as I struggled to find an expression to convey the catastrophic tragedy of autism which has now destroyed the lives of over 20 million children and shattered their families." He said he will use other words to describe the autism crisis in the future. Kennedy opposes a California bill that would limit vaccination waivers for schoolchildren. It has generated such bitter debate that some opponents have compared the proposal's author online to Adolf Hitler. State Sen. Richard Pan, a Democratic pediatrician from Sacramento, said he was under added security in response to his bill. The proposal will be heard Wednesday in a Senate education committee. Thursday marks Holocaust Remembrance Day. "The word holocaust should never be used as a flippant throwaway line to make a point in a debate," said Assemblyman Marc Levine, vice chair of the Legislative Jewish Caucus, during a Holocaust remembrance event on Monday in the California Assembly. The bill prompted protests outside the California state capitol last week. Some parents turned out to express fear over potential side effects of vaccines and argued the bill would trample parental rights, while others called for stronger mandatory vaccine laws to help protect vulnerable children. One mother, Ariel Loop, told CBS Sacramento the proposed might have prevented her 4-month-old son from contracting measles at Disneyland this past winter, when he was too young to be vaccinated "My infant shouldn't have had to suffer. He shouldn't, still months later, be having complications with his eyes," she said. "I shouldn't have had to fear for his life." "The idea of him or some other child dying from something as stupid as a fever or the complications of that in 2015 is just unnecessary," she said. If the bill passes and is signed by the governor, California would join Mississippi and West Virginia with the strictest vaccine rules in the country, barring parents from opting out for philosophical or personal reasons. The bill gained support after the measles outbreak that started at Disneyland in December and sickened more than 100 people across the U.S. and in Mexico. Most of those sickened had not been vaccinated.